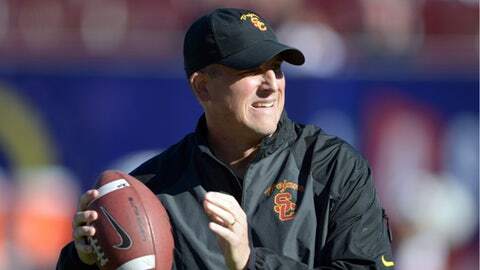 Clay Helton, 41, was offensive coordinator at Memphis before coming to USC in 2010. LAS VEGAS — USC offensive coordinator Clay Helton, who guided the Trojans to a 45-20 victory over Fresno State on Saturday in the Las Vegas Bowl, will be retained by new Coach Steve Sarkisian, The Times has learned. A person with knowledge of the situation confirmed that Helton would remain on staff. Sarkisian previously announced that receivers coach Tee Martin would be part of his staff. Sarkisian implemented a no-huddle, hurry-up offense at Washington this season and plans to run it next season with the Trojans. Helton, 41, was offensive coordinator at Memphis before coming to USC in 2010 and has experience running a no-huddle offense.